Just yesterday the soccer world was shocked (good/bad), even though it had been a possibility, to hear that Diego Armando Maradona would be the new coach of the Argentinian national team. "Diego," as he's simply known in most soccer-literate places is synonymous with soccer due to his personality, play, memories, and political views. If Pele is the King of Football then, Argentinians argue, Maradona is God. 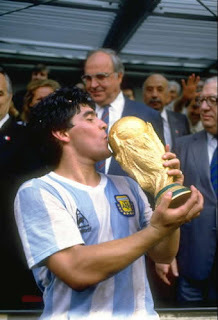 I'm torn here because I grew up watching Diego completely tear it up in 1986 (hand of God and best goal ever in the 2-1 game against England in the quarterfinals), then saw him cry at Argentina's loss to Andreas Brehme's questionable penalty in the Italia 1990 World Cup final against Germany, and fall from grace in 1994 after scoring against Greece while subsequently testing positive for doping. I was also in vigil when his life was threatened due to substance abuse and other health problems 2 years ago. Further, his political stance annoys me (pro Castro and Chavez, no to the US). I question the wisdom of his appointment as a coach, however, since he has no real previous experience. Given his past history this will either be an amazing run for Argentina and further proof of his status as a sports deity or a catastrophic fall from grace far greater than Hugo Sanchez's for Mexico's Olympic qualifying in 2008 or even Diego's own failure in 1994. Still, I'll cheer him and Argentina on (except in fixtures against Ecuador or those that might affect its fight for a place in 2010). Cheers, Diego. And may the force be with you. One more week after this and then more in depth analysis of the season as a whole with caveats about the playoff attendance numbers. It's a weird number to have, but 31 is the allotted number of games for every team (there are 14 teams in the league). Barring any last minute supercrowds at Columbus, New England, Dallas and Colorado, it's safe to bet that this year will fall short of last year's mark but only by about 100 seats (~1%). That's a minuscule amount in the grand scheme of things but certain places like Dallas have seen drops of more than 14%. My weekly difference of 2008 minus total 2007 shows the trends in a clearer manner (see yellow bar graph on right column). To counter that places like LA, Chicago and Houston have seen increases of up to 7%. We can only speculate how these numbers will change next season if Beckham doesn't return until mid-May. Finally, to synthesize some of the latest numbers in terms of my patented relative attendance, I've decided to post high resolution plots of the median relative attendance, i.e. how full the stadium was on any given matchday. 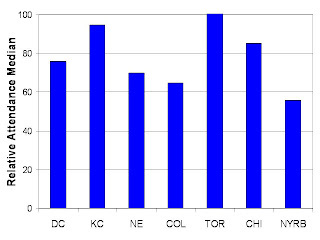 In the east TFC rules the land at 100% for almost every match, KC follows due to its relatively small stadium, and DC and Chicago also show good numbers in the high 70s and 80s. The Red Bulls below 60% is a bit troubling. Let's see how these numbers hold up when the new stadium opens. 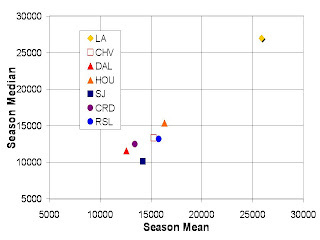 For the west LA tops it with most matches as sell-outs, plus San Jose's small stadium. Some surprising numbers include that for Colorado at more than 60% as well as a recovering RSL at 60%. Numbers tend to be smaller in the west for whatever reason. April to October. November for the ridiculous playoffs. That's the MLS season. 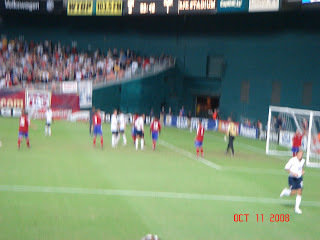 Some wonder why teams like the New England Revolution, DCU, Chivas USA with players like Marcelo Gallardo, Twellman, Sacha Kljestan could possibly lose to lowly Panamanian Tauro or Caribbean side Joe Public. 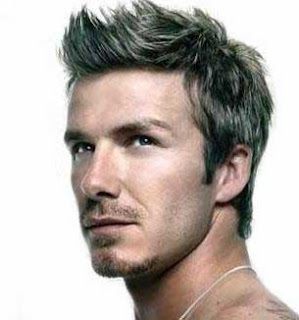 No wonder Beckham will be going on loan to AC Milan for the duration of the long MLS break. Who's to blame? That's complicated. Assuming the loan is for the winter months and that Milan officials are expecting him to play for the remaining of the season in 2009 and possibly the UEFA cup then he would effectively be missing two months our of the 2009 MLS season (April and May since April 15 marks the end of the MLS transfer window) and possibly March if MLS officials decide on a longer season. In all fairness, continuous competitive play would keep Becks healthy and in good standing for future call-ups to the national team by Capello. In terms of the MLS, however, Becks's move would hamper ticket sales and credibility in the league both domestically and abroad. Some of the "blame" could go to the salary cap currently imposed at MLS. I say "blame" because in reality it's not such a bad idea. I think that the minimum should be raised, however, from $9,000 to at least $30,000 and while also raising the team-wide cap by at least 2 times as much whilst at the same time keeping the competitiveness that reigns in MLS. Let's not forget that many European leagues are starting to look at MLS's salary cap as an important way to cut their expenses and encourage more competitive leagues instead of having the same 4 teams always at the top of the table and always present in the Champions League. 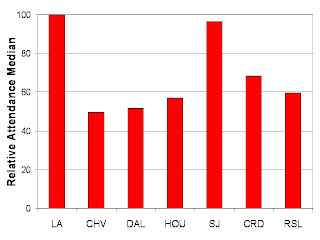 Another factor is the general lack of depth in MLS. When a team like Man City loses one or two forwards, they still have players that would be indisputable starters in other teams (Nery Castillo, Felipe Caicedo). Here in the US if DCU loses Moreno or Emilio they sometimes turn to midfielders like Quaranta. There's definitely a danger in the Becks loan to Milan. Some say the move could be permanent at the end of next season. That would be atrocious for the league since they would lose the new fan base that may have taken a few more years to become permanent. Still, the LA Galaxy's ridiculous record (no playoffs for two seasons and over 50 goals against this season) is easily another factor. Ultimately, if Beckham goes, everyone loses here in the US and the only consolation prize may be the Designated Player rule--maybe adding an additional one won't hurt. Bringing players like Henry, Ronaldo and Figo may attract some fans but nowhere near as many as Becks brought to our shores. A longer season a-la-Europe may be a tough sell at this point but then again so is the idea of a single table due to the extreme distances between cities in this country. Another option is the two tournament style league that dictates, in South America and Mexico, places in the Concachampions, Sudamericana and Libertadores. Gazidis and Garber have hinted at future changes in scheduling. That is a start. But with the Becks dilemma and poor showings internationally, things suddenly look difficult for MLS... and they're thinking of expansion cities. Barring any further upsets, count Mexico in and perhaps Honduras as well if Jamaica fails to score on multiple occasions against Canada. Guatemala needs a miracle to top T&T. From there I think I like USA, Mexico, Costa Rica and Jamaica (Honduras). Agreed? Lots of goals. Lots of fun. Lots of people. Plenty to digest from Jozy's goal to Beasley's 2 goals, Donovan's composure, Torres' first game, Ching's perfect possitioning, and a stout defense with Boca, Dolo, and Gooch as impenetrable pillars in the back. 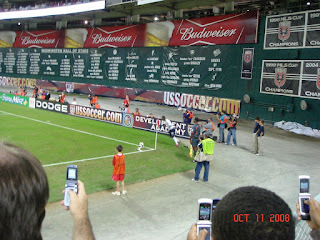 But what else did I take from my first experience at a US World Cup qualifier? The fans, the feelings, and the joy of football. It was enough to get my wife and the other female in our group excited enough to yell and chant with us boys and take lots of pictures and memories.What else stood out for me? Diversity. Both on-field and in the crowd. First we have a team that's the most varied in the world... Where else will you get a team with last names like Adu (Ghana), Altidore (Haiti), Torres (Mexico), Kljestan (Serbia), Ching (Hawaii, Asian background), Bocanegra (latin american background), Onyewu (African background), as well as usual suspects like Howard, Beasley, Donovan, Pearce and co.? Only in the US. And only in the US will you get a crowd like we had. I saw plenty of people with Asian backgrounds, Caribbean, African, European, Latin American and the like... and we all cheered for the USA together and sang the national anthem together. It was a lovely experience and we also got a treat from a full national squad that showed why the US is the top nation in the Concacaf region. Enjoy the pics and the video (not mine, by the way) of Jozy's goal. For an even more personal view of the game in all its splendor check out a buddy of mine's blog. He's got some nice caveats about the DC area and the whole experience as a novice (like myself) at a world cup qualifier. Back again after a brief respite. Probably will join you next week as the season winds down. There's only 3 more weeks of play after this week. 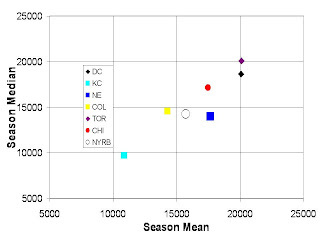 I'm including the mean vs media plot to show some of the more recent happenings in league attendance. DCU was boosted by its last game at home, and they can forget about any further play until next season unless something miraculous happens. No more DP (Gallardo) this season. The guy played okay so no fuss with him, people. He wasn't a complete mess like Denilson. More important is my current focus on Dallas. The team has very legitimate chances of advancing to the post-season since only 5 points separates them from the Goats and there are 9 points to be had still. They have one more home game against TFC and somehow I doubt they'll have more than 40% of seats full at the Pizza Place they call their stadium. It's sad since they also boast one of the league's top scorers and potential national team star Kenny Cooper (Bradley has yet to name him to the squad and fans are upset). Cooper has 16 goals this season and is second only to record-breaking Landon Donovan (19). Clearly, something needs to be done at the big D if they want to both keep their franchise and/or earn respect. You'll note that they have the lowest mean and the lowest median. Both point to the same huge problem. But I just work with the numbers here people, as sad as some may look. I say bring in another DP player. Maybe a Mexican figure with stature or someone that people actually care about seeing. Yes, that's right. Pachuca's Jose Francisco Torres has elected to play for the United States instead of Mexico and will (might) feature in the upcoming qualifying games at RFK and then Port of Spain. 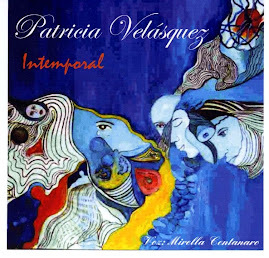 This occurs after being insistently courted by both the US and Mexico for some time now. Some facts: Torres was born in Texas but has Mexican descent. He decided to skip high school when a good opportunity to train and possibly play for a major Mexican league team (Pachuca) appeared. 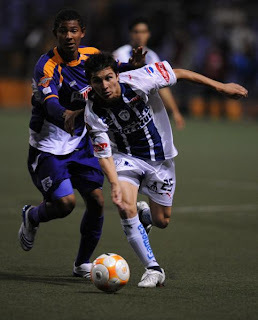 The 20-year-old has played 20 games for Pachuca scoring once. 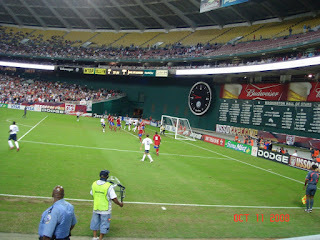 He also scored during the now defunct Concacaf Champion's Cup against none other than DC United. So why's this important? Well, it comes on the heels of American-born Giusseppe Rossi's choice to play for Italy instead of the US. That's right, the same Rossi that has been lighting it up with Jozy Altidore's Villarreal as well as the Italians at the Olympics. Another target the US is after and may lose to Germany is Yugoslav-born but somehow American, Neven Subotic. This kid currently features for none other than Borussia Dortmund of the German Bundesliga, having played 4 games and scored 3 goals. Let's keep in mind that he also played in the US U-17 and U-20 teams and the University of South Florida. He's eligible to play for Bosnia (birth), Serbia (ethnicity), Germany (residency) and the US (citizenship). What a mess, right? Point is he hasn't made up his mind yet. Maybe Torres' choice (or dissention if you're Mexican and angry about it) will have some impact in Subotic's decision. The US is riddeled with Americanized players: Preki, Dooley, Adu, David Regis, Tab Ramos, Feilhaber, to name a few historic or still playing. Let's keep in mind that some of the current players are not American in direct descent. These include Onyewu, Reyna, Altidore, Kljestan, Orozco, to name a few. But then again, why are they not fully American if they weren't born here. This whole thing can be a bit silly at times. What do I think? Well, in an age of nationalized-to-be-with-a-national-team mentality, I think it's perfectly fine to snag up as many players for the national team pool as you can. In the end it's all about the money and, to a lesser extent, the prestige in the world scene. Very few countries remain purists these days, and that includes Spain (Marcos Senna), Portugal (Deco), Italy (Camoranessi), Mexico (Vuoso), France (Trezeguet), Germany (Klose). There's no salary caps with national teams so why not have an all-star side? Of the countries I just mentioned and except for Klose, all those players are ether Brazilian or Argentinian originally. When it comes to soccer, the world is mostly Argentinian and the rest is Brazilian... but that's another blog. Jozy Altidore went to Villarreal (second only to Real Madrid in Spain's La Liga last season and currently unbeaten in the Champions League including a game tied at Old Trafford against Man U) and saw only a second half against Depor earlier in the season. 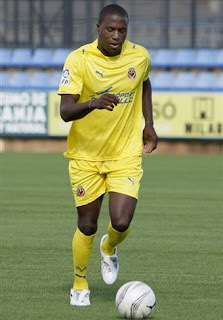 Freddy Adu escaped the Benfica reserves to join France's modest side Monaco only to be used as a last minute substitute. Michael Bradley is fighting for a spot on the German Bundesliga's Borussia Mönchengladbach. Eddie Johnson has fallen out of favor with soccer as a whole and thusly became relegated to English Championship side Cardiff City. He has yet to score a goal for the second division team, much less start. Bryan Arguez has not dressed for Hertha Berlin in God knows how long. Added to these are a long list of national team regulars that include Dempsey, Convey and Pearse that have struggled for a spot in their respective European clubs. So what's wrong? Lack of confidence? Stage fright? Coaches? Whatever it is, it needs to stop. The players must be active with their teams (as lowly as the team may be) in order for them to be at top form. This is especially true realizing that our direct rivals south of the border have impressive players in Europe that are seeing significant playing time, including Omar Bravo and Andres Guardado of Deportivo and Carlos Vela of Arsenal. I would venture to suggest that Jozy be loaned to a more modest European team that will see him get more time on the pitch and get more accustomed to the style of play. Even so, the game he did play in showed his abilities and only nearly missed a couple of shots. What a shift in events could have occurred if those shots had found the back of the net. Well, there's my rant. And I'm not alone: Ives Galarcep of ESPN and Steve Goff of the Washington Post are also very concerned. Let's hope the winds shift soon enough. 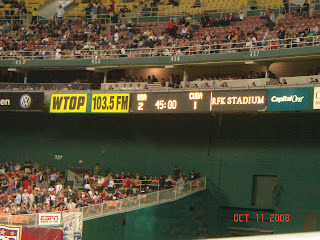 In the meantime I will rejoin you for another MLS stats post and then for my experiences at DC next week when the US plays Cuba for the world cup qualifying.